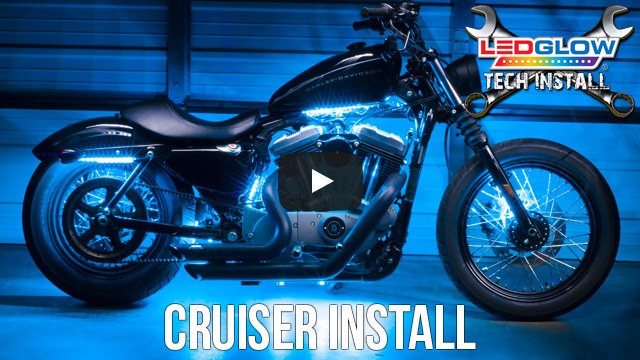 LEDGlow’s Build Your Own Custom Advanced Single Color SMD LED Motorcycle Light Kit allows you to be the artist when it comes to selecting which colors and strip lengths you want installed to your sport bike or cruiser for that one of a kind look. For example, you can choose to illuminate the gas tank with blue, the frame with red and the front forks with white! The options are endless! What are SMD LEDs? SMD LEDs are surface mounted chips that contain 3 individual LEDs used to the create an extremely vibrant and spotless single color glow. Each Custom Advanced Single Color SMD LED Motorcycle Light Kit includes a control box with 4 button wireless remote to select all of the kit’s functions, color and size specific LED light strips chosen by you, as well as a power wire harness specifically for your desired kit size. LEDGlow’s motorcycle LED light strips are available in 8 different solid colors with 4.5", 6", 8.5", and 10.5" strip length variations. 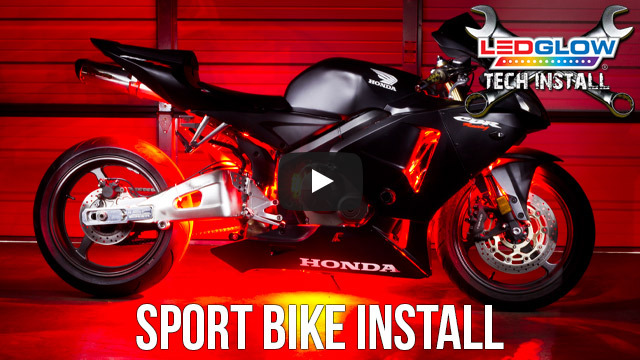 Each motorcycle lighting strip is 1/8" in depth so it can be easily installed to tight locations, 4ft of power wire and has the ability to be contoured to your preferred mounting position using the included 3M™ tape. LEDGlow’s LED lights for motorcycles include a one year limited warranty and free lifetime technical support with each kit purchased. Installed these for a customer. He was very pleased with the setup and his wife is now in love with the Harley. You can count on their tech support if you have any questions. Good Guys! I will be buying from them from now on. Great purchase experience. Received the order faster than expected. Contents were packed well and protected for shipping. The remote control, LED strips and wiring harness are all well made. My kit was designed to improve my visibility in SoCal traffic; mission accomplished. I ordered a "Build Your Own Advanced Single Color SMD LED" Motorcycle Lighting Kit: (Control Box Options: Standard SMD Control Box w/ Remote, Color Option Step 1: White, Strip Size Step 1: 2 - 8.5" Strips (+ $6.00), Color Option Step 2: White, Strip Size Step 2: 2 - 8.5" Strips (+ $22.99), Color Option Step 3: Red, Strip Size Step 3: 2 - 8.5" Strips (+ $22.99), Color Option Step 4: Orange, Strip Size Step 4: 2 - 8.5" Strips (+ $22.99), 3M® Adhesion Promoter: 1 - Packet (+ $1.99)). I would recommend MotorcycleLEDLights by LEDGlow to a friend.